Gladiator—Ridley Scott's historical epic that won the Oscar for Best Picture—told the story of the fictitious Roman general Maximus Decimus Meridius fighting for his life and freedom in order to avenge the murder of his family. On the 15th anniversary of its release, we look back at some things you might not know about the sword-and-sandal hit. 1. STEVEN SPIELBERG GREENLIT THE MOVIE AFTER ASKING THREE QUESTIONS. Screenwriter David Franzoni received a three-picture deal with Dreamworks SKG after writing the script for Amistad. During a "surprisingly brief" pitch meeting with Spielberg for what would become Gladiator, Franzoni told the Writers Guild of America that the director "really had three basic questions. My gladiator movie, it was about ancient Roman gladiators—not American, Japanese, whatever else? Yes, I said. Taking place in the ancient Coliseum? Yes. Fighting with swords and animals to the death and such? Yes. Great, let's make the movie." 2. A PAINTING CONVINCED RIDLEY SCOTT TO DIRECT IT. Producers showed Scott a copy of Jean-Léon Gérôme's’ 1872 painting Pollice Verso, which depicted a gladiator awaiting the judgment of his fight by a coliseum crowd, who would move their thumbs depending on whether they believed a gladiator should live or die based on his performance. (“Pollice verso” is Latin for “with a turned thumb.”) "That image spoke to me of the Roman Empire in all its glory and wickedness," Scott said of the painting. "I knew right then and there I was hooked." 3. JUDE LAW AND JENNIFER LOPEZ AUDITIONED FOR ROLES. Law tested for Commodus, but Joaquin Phoenix ran away with the role. Lopez reportedly tried out for Lucilla, but lost out to Connie Nielsen. 4. RIDLEY SCOTT DENIES THAT MEL GIBSON WAS HIS FIRST CHOICE FOR MAXIMUS. While it has often been stated that Gibson turned down the lead role in the film, making way for Crowe, Scott insisted to CNN that "Russell was really always my first choice." He had seen him in 1992's Romper Stomper, and "thought he was someone worth watching." 5. COMMODUS AND LUCILLA WERE REAL PEOPLE. Whereas Maximus is a work of fiction, Commodus and Lucilla are not. In 182 A.D. Commodus survived an assassination attempt by his sister Lucilla. He gradually became even more megalomaniacal, even renaming Rome "Colonia Commodiana" (Colony of Commodus). He was eventually strangled to death by a champion wrestler named Narcissus (who had been hired by Commodus' advisers). 6. SCOTT GOT PERMISSION TO BURN DOWN A FOREST. 7. ONLY A PART OF THE COLOSSEUM WAS REAL. A 52-foot high fragment of the first tier of the arena was built, measuring about one-third of the circumference of the original Colosseum, as well as the bowels with the rudimentary elevator system. The rest of the arena—including the other tiers and the retractable roof—was CGI. 8. OLIVER REED PASSED AWAY BEFORE FILMING WAS FINISHED. 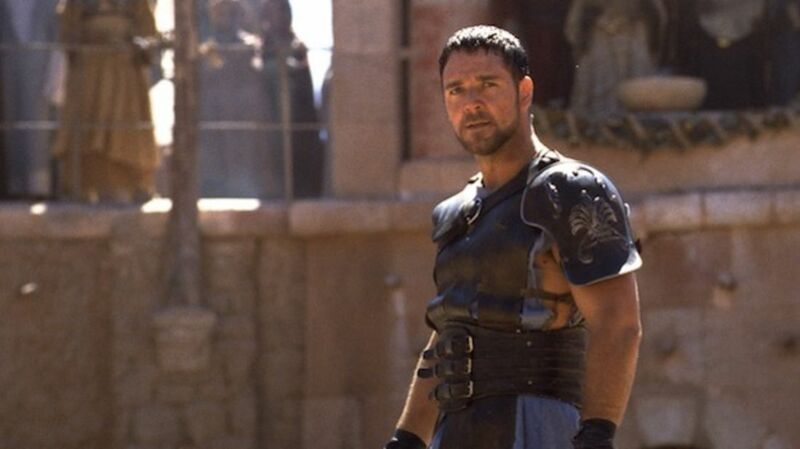 Reed died from a heart attack on May 2, 1999, while in the midst of filming Gladiator in Malta. His character, Proximo, was rewritten to die, but not all of his major scenes had been shot yet. So Scott used CGI in order to work around his passing, digitally scanning Reed’s face onto an extra in order to finish filming. 9. CROWE INJURED HIMSELF DURING FILMING. A LOT. Crowe lost all feeling in his right forefinger for two years after a sword fight, aggravated an Achilles tendon injury, broke a foot bone, cracked a hip bone, and popped a few bicep tendons out of their sockets at different points in the production of the film. 10. CROWE WASN'T THRILLED WITH THE SCRIPT (OR LACK THEREOF). While appearing on Inside the Actors Studio, Crowe said that only 32 pages of the script were completed when shooting commenced. Co-writer William Nicholson recounted how Crowe once told him, “Your lines are garbage but I’m the greatest actor in the world, and I can make even garbage sound good.” Initially, Crowe didn’t care for the now-famous line “And I will have my vengeance, in this life or the next,” but repeatedly failed to ad-lib anything better. 11. JOAQUIN PHOENIX DECIDED TO CUT HIS HAIR AND GAIN WEIGHT AFTER FILMING HAD STARTED. While reading the script one morning two weeks into production, Phoenix (who earned his first Oscar nomination with Gladiator) thought it made sense that Commodus would grow physically larger as his belief in his own power as Emperor increased. Phoenix also kept a sword in his hotel room. 12. PRODUCERS PURPOSELY AVOIDED SOME POINTS OF AUTHENTICITY. Much like today's most celebrated athletes, Roman gladiators actually did product endorsements. But the producers didn't think that audiences would know—or believe—that, so left it out of the film. 13. JOHNNY CASH WAS A FAN OF THE FILM. Before he was hired to play the legendary singer in Walk the Line, Phoenix recalled to The Guardian how he once met Johnny Cash by pure coincidence, and how he "started quoting to me the most sadistic dialogue from Gladiator with obvious relish." 14. HANS ZIMMER WAS SUED FOR HIS WORK ON THE SOUNDTRACK. The estate of composer Gustav Holst believed that Zimmer plagiarized Holst’s "Mars, Bringer of War” for “The Battle.” So far, there hasn’t been an official announcement on the verdict. 15. NICK CAVE WROTE A SEQUEL INVOLVING A TIME-TRAVELING MAXIMUS. As Cave is best known as a musician, it seemed surprising to some that Crowe and Scott asked him to write a sequel to Gladiator. Cave dealt with the whole "Maximus is dead" problem by having the Roman gods reincarnate him in his script. The plan was for him to then be somehow transported to World War II, the Vietnam War, and then become a modern-day General at the Pentagon. The studio rejected it.